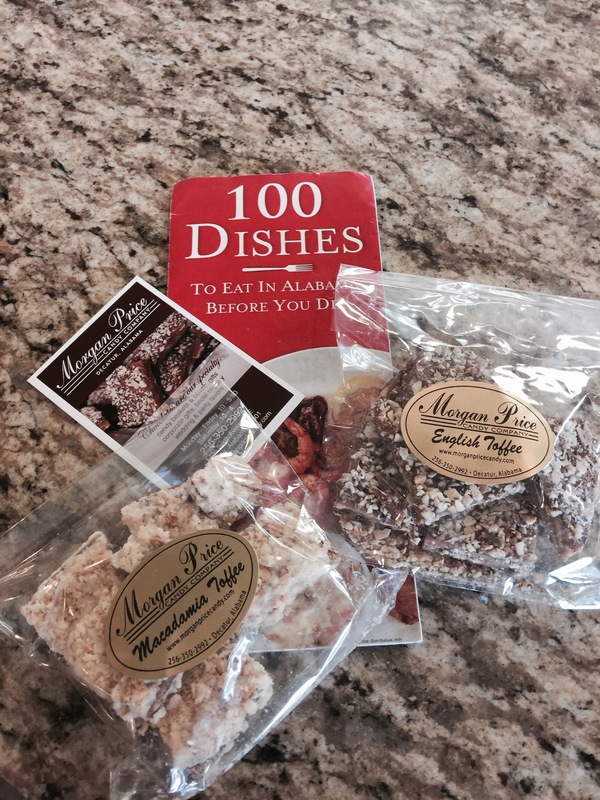 English Toffee at Morgan Price Coffee Company, located in Decatur, Alabama is my 100 Dish MEGabite stop. Number 21 or 80 on my countdown. This family recipe is made from buttery toffee and frosted with premium chocolate and sprinkled with toasted almonds. This deliciousness is described as “…the perfect sweet, salty and crunchy treats…”-Alabama Tourism Board. The shop is a fun stop. The woman who was working nicely stopped to answer my questions. You are able to see the kitchen and racks of various candies along with some unique shop items. The English Toffee and was every bit as delicious as it was described. I also bought the Macadamia Toffee. They were both so over the top delicious; I had to take some home for myself and a few packages for gifts. *for wonderful people and a really nice, clean and inviting shop. * Meets the criteria of local food with Alabama pride. Can’t get there? You may order on-line. They also have some fantastic baskets that would be great gifts or raffle donations. Playing 100 Dishes? Located next door to Big Bob Gibson Bar-B-Q., you have the ability to stuff your face and knock off a few dishes. Try the Macadamia Toffee-yum! I simply loved it! Located about 15 minutes off of 1-65, it is a pretty easy stop.